Got the kit installed today, at first I thought 100% was about right, until I went for a drive this evening and decided to settle for 50%, and glad I went for the remote dimming set. Two things though - 1, to get the light through to the passenger side, following the instruction, I only able to very vaguely see light shining through the gap. I will suggest get the light and wire as straight as possible, then feed it as far as you can. After that, stick your finger into the gap of the glove compartment. You should be able to feel the wire (or push it out of reach), and can try to pull it out. Took me 3 attempts to get it. Is there any chance you can send me the guide to install so I can judge how easy it is? Or do you have a YouTube video? Thanks! We don't send the instructions out without a kit as Rick has had copycat sellers in the past using his instructions. On the 10G it is really easy, you feed and fit the kit into place in both front footwells then it uses the plug connector on the interior fuse box for power and a loop connector to a metal contact for negative. Can you send me a PM with details for a set of the remote dimmer 9 LED kit with the plug & play kit for a 9G please. If i order 2 foot well kits would that be 4 x led strips? I'll check if Rick has them in stock but usually if you specify they are for the rears, they can be supplied with longer cables..
Will supply a standard kit with rear instructions but you will have to extend the positive wire yourself. Negative can be mounted at the rear anyway. Hey im after 2 sets of red Led’s but can i clarify that 1 kit = 2 led strips so in total i require 4 led strips. Each kit comes with two strips, one left and one right, so if you want to do front and rear you need two kits. If you want to proceed, please drop me a PM for payment details. Cheers for the reply. Is it £26 for what im after front and rear? Apologies, despite having notifications set to instant, I am not getting any notifications through from subscribed threads. Latest attempt at prices, hopefully no typos! 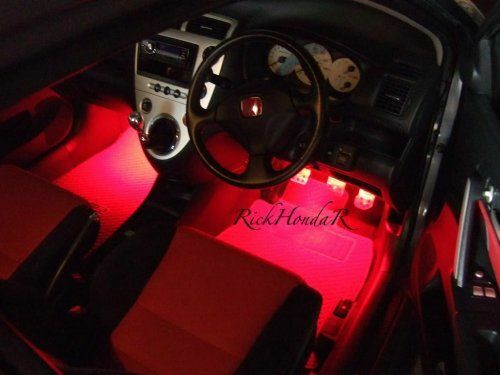 I've been in touch with RickHondaR and arranged to start selling his LED Footwell Lighting Kits on the forum again. We are able to offer them for a discounted price on the forum (less than Rick's eBay listings). 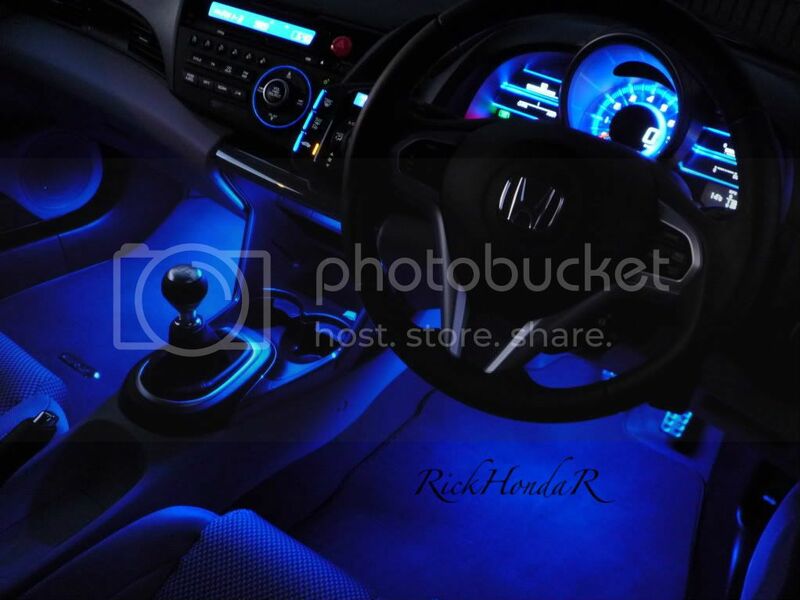 Rick also now does a Plug & Play kit for 8G/9G/10G Civics and 2012+ CRV! For an extra £10 (over the base price), Rick can now offer these kits with a full Plug & Play with the OEM option connector for 8th Gen, 9th Gen Civic, 10th Gen Civic and 2012+ CRV, as sold separately in this thread. Please note, that 10G Civics are only available with the option connector. Also Fiesta MK6, Fiesta MK7, Fiat 500, Corsa C, Corsa D.
Alright, those last few aren't Hondas, but feel free to spread the word and order them on your mate's behalf. If you are interested in a set, then please send post in the thread and move to PM (to me Loxy) for payment details. I can also accept bank transfer, please PM me (Loxy) for details. Make sure you send it as Paypal gift, and in the notes mark down your address, which car and which colour so that I can get the info to Rick as quickly as possible. Rick will be dealing with any post sales technical issues but please feel free to contact me for anything to do with delivery/payment etc. +£10 for the 8G/9G/CRV full Plug & Play kit. Include address and car/colour in the Paypal payment. Buyer covers Paypal fee (if any). This kit is manufactured to my specifications in the same factory as the LED and my fitting instructions are specifically written for the vehicles advertised below and not a useless universal guide that tells you how to connect the LED to a battery or cigarette lighter. With my instructions you get a full detailed step by step guide like a Haynes manual on how to fit and wire this into your car so no wires will be on show and thatthe finished product will look very professional. Now with OEM Plug & Play Manufacturers wiring harness plug option. 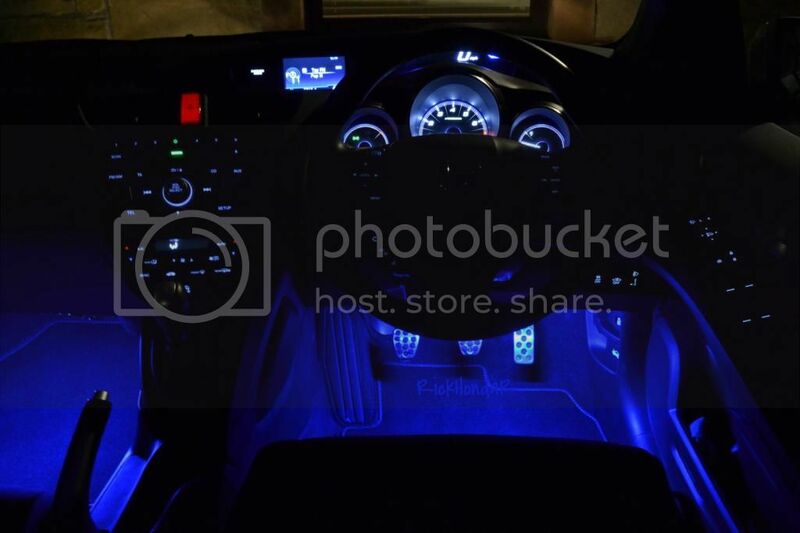 If you select the dimmer option you will get the latest specification kit with the latest LED chip design that is around 300% brighter than the kit in the pictures while maintaining an approximate 20% power increase so this will not overload your existing car electrical circuit or cause a fire hazard. 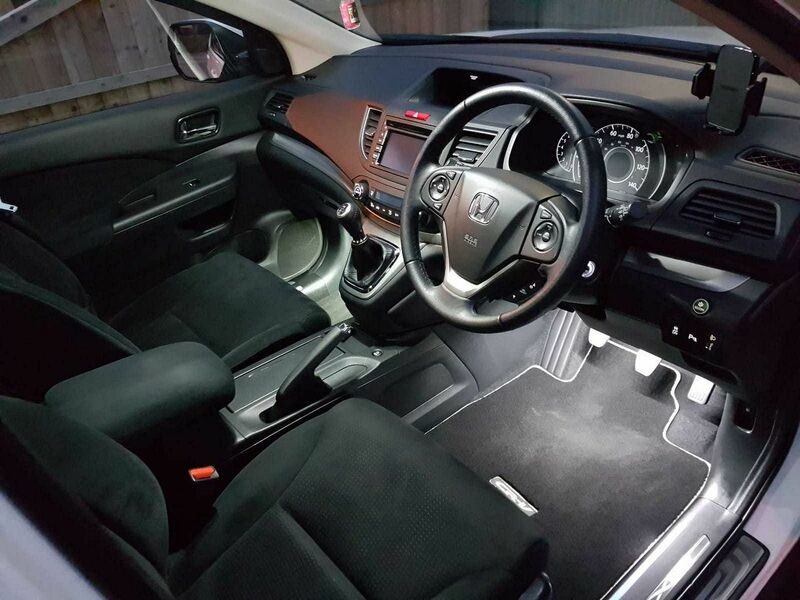 On top of this the kit then comes with a built in remote control dimmer unit that allows you to set the exact brightness that you like or use one of the pre-set levels like 100%, 50%, 25% etc, the dimmer also has a smart memory so will remember your last setting when returning to your car. If you have your headlights set to welcome mode this will also illuminate when dark as you unlock and lock your car. 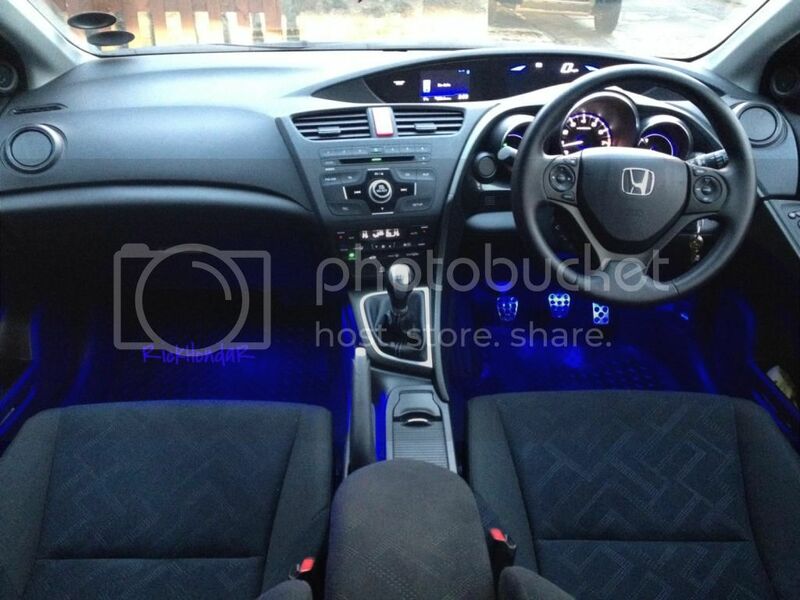 These LEDs are approx 100% brighter than the OEM Honda LED. 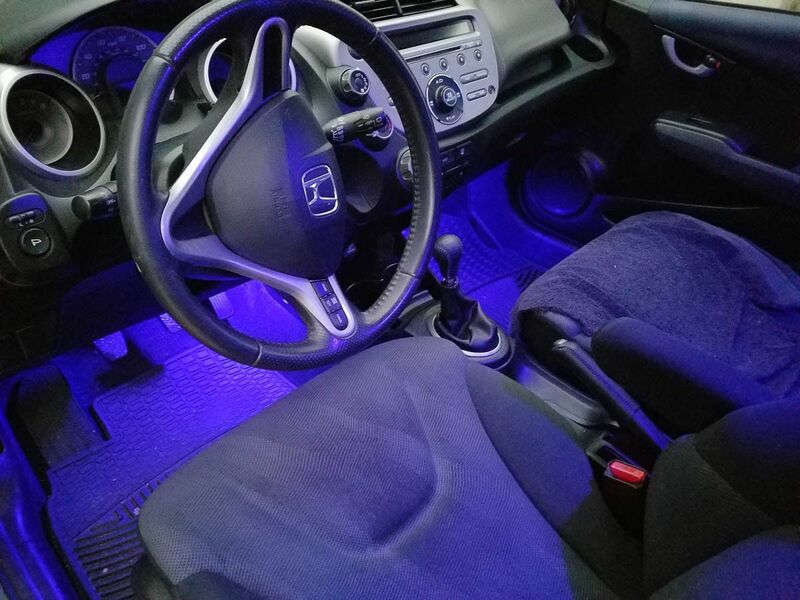 Please note the LEDs will not illuminate if you turn the interior light on with the switch on the light and this is harder to install due to the 2 wires you have to connect being harder to get at under the dash, having said that some people find this hard while others find it easy. I provide instructions on where to wire this kit so this will illuminate with your ignition is on etc. Please note my kit is a hard wired "plug n bolt" installation so no wires are cut or spliced and comes complete with an individual fuse carrier, this is the best solution for professional OEM style installation. Please note; LHD models will be the same with my instructions but a little common sense will be required. 2 x Flexible strips of 9 RED, BLUE or Xenon White miniature ultra bright LEDs that will provide an even amount of lighting complete with self adhesive 3m backing, I don't supply more LEDs as the strip would then be to long to stick in the footwell and maybe to bright which could draw unwanted attention. Built in dimmer unit with credit card size remote control (If you have choose YES for the dimmer option). 2 x power connection terminals or scotch locks so no wires are cut, If you choose the OEM Plug & Play option I supply the original manufacturers wiring harness plug so this can be simply plugged into the internal fuse box. 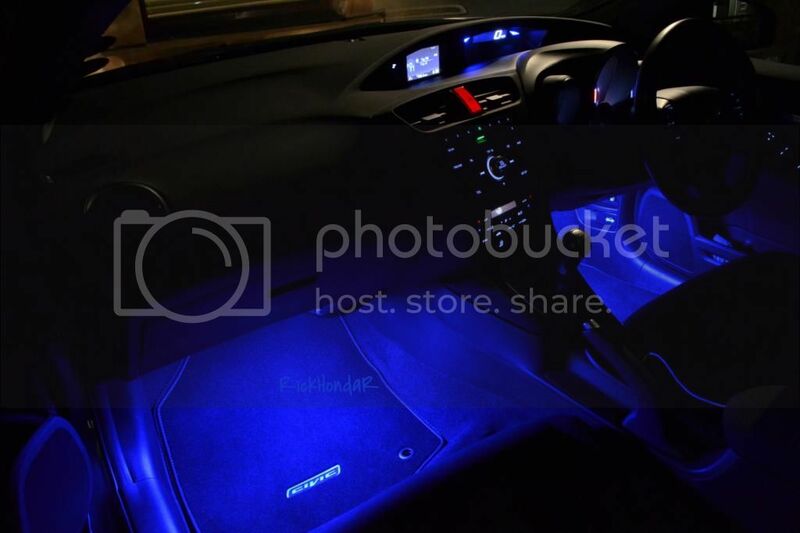 Simple step by step instructions on how to install your ambient footwell lights with colour pictures. 1. This kit is ready to fit and comes complete with simple step by step fitting instructions which are specifically written for the model vehicle advertised. You usually find other products come complete with generic universal instructions and you are expected to have the knowledge on where and how to wire this to your vehicle. I am also a fully qualified time served 17th edition JIB approved electrician which enables me to give you good advice with support and help with my product if required. 2. 1 year guarantee and a 100% money back satisfaction guarantee (see my terms and conditions). 3. Reputation and service, I aim to provide the service that I would expect if I was the buyer. 4. UK seller so quick dispatch (next working day). 5. Communication, if you call me for help etc and for some reason I don't answer my phone and you leave a message I WILL ALWAYS RETURN YOUR CALL. 6. Most important of all QUALITY, the LED I sell is high quality LED in copper thread not alloy thread and is applied on a double sided printed circuit board tape not single sided like the cheaper stuff. 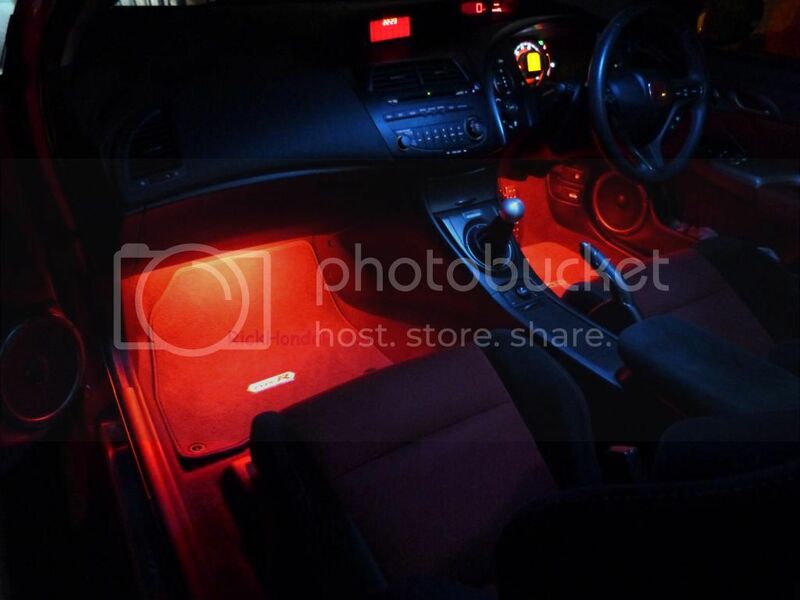 The footwell lighting kit is also made to my specifications in the same factory as the LED tape so again quality is very good. and of course variable dimming to your exact requirements and will remember the last setting you have selected when you return to your car. last setting you have selected when you return to your car. UK postage only if you want to buy overseas please ask for prices! Last edited by Loxy; 15th April 2019 at 23:15. That is two standard kits, and I'm guessing without the option connector. They are normally £17.50 each, but as you are buying two I can do two kits for £31 delivered to the UK. For the CRZ without the option connector, £27 for the remote dimmer kit and £17.50 for the standard kit so £45.50 for the two. I'll take your word for it on the special free ones, I'll check with Rick when the order comes through. Payment details will be sent via PM in order to keep within the forum rules if you are happy to proceed? 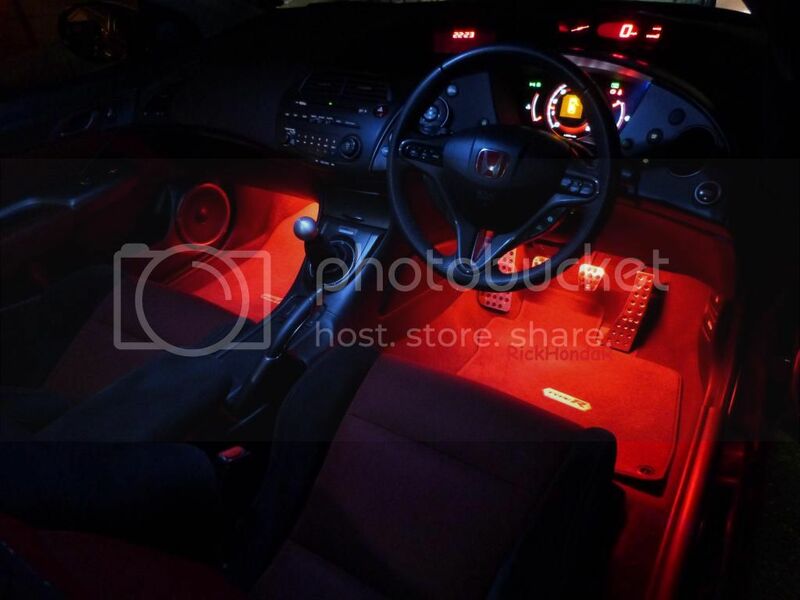 Would like the plug and play remote multi-colour 9 LED kit. Once connected when do the lights turn on and off? Also, where are the buttons located for the dimmer and to change colour?